Marguerite Renouf BSc(Hons)/BA, PhD (Env Man) UQ is a Research Fellow at the School of Chemical Engineering's Water-Energy-Carbon Research Group (www.chemeng.uq.edu.au/water-energy-carbon). 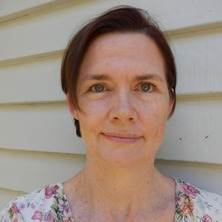 She has worked in environmental research at UQ for 15 years, with a particular interest in the environmental evaluation of production systems and urban systems using environmental life cycle assessment (LCA), urban metabolism evaluation and eco-efficiency analysis. She is interested how we can produce and consume with less drain on the environment. Since completing a PhD in 2011, she has driven a stream of research that evaluates the environmental performance of agri-based product supply chains and products (bio-fuels, bio-materials, food, beverages) using LCA. She has collaborated with industries and researchers in Australia and overseas to develop LCA tools for industry to support the identification of more environmentally-friendly production practices and processes. Prior to this, her research was concerned with eco-efficiency in manufacturing industries (food processing, metal industries, retail and tourism sectors) and was a long-term contributor to UQ’s Working Group for Cleaner Production (now operating as the Eco-Efficienc Group), and its Director for three years (2009-2012). Currently, Marguerite is a lead researcher with the CRC for Water Sensitive Cities, develop methods and metrics for quantifiying the water water-sensitive performance of Australian cities, using urban metabolism approaches. In this work she collaborates cloesely with urban planners, water manager and architects. Developing and applying evaluation methods that quantify how efficiently water is used and managed in urban areas (cities, precincts, catchments). This is used to help urban planners and water managers make strategic and innovative decisions about how water systems are desgined, particularly in fast-growing cities. Quantifying the environmental performance of food products and food systems using the 'life cycle assessment' (LCA) method. This is used to understand priority areas for improving the environmental sustainability of agriculture, food processing and distribution and retail. Refining methodologies for characterising and quantifying the environmental impacts of agriculture in 'life cycle assessment' (LCA). This is needed to ensure an accurate representation of the environmental impacts agriculture, for use in studies of food and bio-products. The environmental impacts of most interest are water quality impacts (eutrophication, eco-toxicity), water resource depletion as well as global warming potential. Marguerite's PhD research used life cycle assessment (LCA) to test the environmental benefits of using sugarcane as feedstock for bio-energy, bio-fuels and bio-materials. This work has helped understand the consequences of agriculture's changing role as a provider of energy and materials in addition to food and fibre. For example, the Queensland Government policy on bio-fuels drew on Dr Renouf’s research and data about sugarcane ethanol. An extension of this was industry-funded research to develop the CaneLCA eco-efficiency tool for susugarcane producers (available at eshop.uniquest.com.au). It has been used by researchers and agricultural extension personnel to inform about more sustainable sugarcane growing practices. For example, a sugar-industry project used the tool to validate the environmental benefits of improved sugarcane growing practices to protect water quality in the Great Barrier Reef. A tool of viticulture (VitLCA) has also been developed in collaboration with an agricultural University in France, which is being used to teach vineyard apprentices about sustainable viticulture practices. Marguerite has influenced LCA developments in Australia. She has been an active member of the Australian Life Cycle Assessment Society (ALCAS), including a Board Member (2013-2017), Chair of the Australian Life Cycle Inventory (AusLCI) Database Agriculture Working Group (2008-2014) and the ALCAS Impact Assessment Committee (2013-ongoing), and on the conference organising committee (2013, 2015). Her past contributions to UQ’s Working Group for Cleaner Production (1997 - 2012) helped support the Queensland Government's promotion of sustainable practices to Queensland manufacturing sectors (food processing, foundries, metal finishing, marine construction and general manufacturing). This included high-quality eco-efficiency information resources about (www.ecoefficiency.com.au), which continue to be a primary source of technical guidance for implementing eco-efficiency in these industries. Framework for Integrated urban water management for infill development with limited dependency on urban infrastructure. Pagan, R. J., Renouf, M. A. and Prasad, P. Eco-efficiency Manual for Meat Processing. Sydney: Meat and Livestock Australia Ltd, 2002. Kershaw, Will and Renouf, Marguerite (2013). Sustainable production. In Gianna Moscardo, Geoffrey Lamberton, Geoffrey Wells, Wayne Fallon, Phillip Lawn, Anna Rowe, Jacquelyn Humphrey, Retha Wiesner, Brad Pettitt, Don Clifton, Marguerite Renouf and Will Kershaw (Ed. ), Sustainability in Australian business : principles and practice (pp. 315-342) Milton, QLD, Australia: John Wiley and Sons Australia. Renouf, M. A., Schroeder, B. L., Price, N. and Allsopp, P. G. (2014) Assessing the environmental benefits of practice change using the CaneLCA eco-efficiency calculator. International Sugar Journal, 116 1390: 754-765. Renouf, M. A., Schroeder, B. L., Price, N. and Allsopp, P. G. (2014) Assessing the environmental benefits of practice change using the CaneLCA ecoefficiency calculator. International Sugar Journal, 116 1390: 754-759. Pagan, R. J. and Renouf, M. A. (1999) A whole of life approach to sustainable food production. Industry and Environment, 22 2-3: 13-17. Renouf, Marguerite, Eady, Sandra, Grant, Tim, Grundy, Mike and Brandão, Miguel (2014). Representing soil function in agriculture LCA in the Australian context. In: Rita Schenck and Douglas Huizenga, Proceedings of the 9th International Conference on Life Cycle Assessment in the Agri-Food Sector (LCA Food 2014). 9th International Conference on Life Cycle Assessment in the Agri-Food Sector (LCA Food 2014), San Francisco, United States, (1086-1091). 8-10 October 2014. Renouf, Marguerite A. and Fujita-Dimas, Carlos (2013). Application of LCA in Australia agriculture: a review. In: ALCAS Conference 2013: 8th Life Cycle Conference, Sydney, NSW, Australia, (1-14). 16-18 July, 2013. Renouf, M. A., Schroeder, B. L., Price, N. and Allsopp, P. G. (2013). Assessing the environmental benefits of practice change using the CaneLCA eco-efficiency calculator. In: R. C. Bruce, Proceedings of the 35th Conference of the Australian Society of Sugar Cane Technologists. ASSCT 2013: Conference of the Australian Society of Sugar Cane Technologists, Townsville, QLD, Australia, (1-13). 16-18 April, 2013. Renouf, M. A., Allsopp, P.G., Price, N. and Schroeder, B. L. (2013). CaneLCA: a life cycle assessment (LCA)-based eco-efficiency calculator for Australian sugarcane growing. In: R. C. Bruce, Proceedings of the 35th Conference of the Australian Society of Sugar Cane Technologists. ASSCT 2013: Conference of the Australian Society of Sugar Cane Technologists, Townsville, QLD, Australia, (1-8). 16-18 April 2013. Hobson, P.A. and Renouf, M. A. (2013). Development of a tool for rapid life cycle assessment of sugar and associated energy products. In: R. C. Bruce, Proceedings of the 35th Conference of the Australian Society of Sugar Cane Technologists. ASSCT 2013: Conference of the Australian Society of Sugar Cane Technologists, Townsville, QLD, Australia, (1-9). 16-18 April, 2013. Prasad, P., Renouf, M. A., Williams, M., Pagan, R., Price, N. and Gaffel, J. (2010). Eco-efficiency in Australian food processing: An update of implementation, drivers and barriers. In: SCP: A Strategy to Meet Global Challenges in Business and Industry. 9th Asia Pacific Roundtable for Sustainable Consumption and Production, Colombo, Sri Lanka, (). 10-12 June 2010. Renouf, M. A., Pagan, R. J. and Wegener, M. K. (2010). Environmental benefits and trade-offs of producing bio-energy and bio-materials from Australian sugarcane. In: Proceedings of the Australian Society of Sugarcane Technologists. Conference of the Australian Society of Sugarcane Technologists, Bundaberg, Australia, (). 11-14 May 2010. Price, N., Renouf, M. A. and Pagan, R. J. (2010). Outcomes of mandatory water efficiency in business - A case study from South East Queensland, Australia. In: 9th Asia Pacific Roundtable for Sustainable Consumption and Production, Colombo, Sri Lanka, (). 10-12 June 2010. Marguerite Renouf (2007). Comparing agricultural crops for bio-product applications. In: Book of Proceedings of the 5th International Conference of LCA in Foods. 5th International Conference on LCA in Foods, Gothenburg, Sweden, (64-68). 25-26 April, 2007. Marguerite Renouf and Wegener, Malcolm K. (2007). Environmental life cycle assessment (LCA) of sugarcane production and processing in Australia. In: R. Bruce, Proceedings of the Australian Society of Sugar Cane Technologists. 29th Conference of the Australian Society of Sugar Cane Technologists, Cairns, (385-400). 8-11May 2007. Marguerite Renouf (2007). Life cycle assessment (LCA) of diversified crop systems for bio-products. In: Schuck, S., Bioenergy Australia 2007. Bioenergy Australia 2007, Gold Coast, (). 26- 27 November 2007. Renouf, M A (2006). LCA of Queensland cane sugar - lessonsfor the application of LCA to cropping systems in Australia. In: Australian Life Cycle Assessment Society Ltd, 5th Australian Conference on Life Cycle Assessment, Conference Proceedings, Melbourne: Achieving Business Benefits from Managing Life Cycle Impacts. 5th Australian Conference on Life Cycle Assessment, Langham Hotel, Southbank, Melbourne, (1-15). 22-24 November, 2006. Renouf, M. A., Antony, G. and Wegener, M. K. (2005). Comparative environmental life cycle assessment (LCA) of organic and conventional sugarcane growing in Queensland. In: Hogarth and D.M., Proceedings of the Australian Society of Sugar Cane Technologists. 27th Conference of the Australian Society of Sugar Cane Tech., Bundaberg, (312-323). 3-6 May, 2005. Antony, G., Smith, D.M., Biggs, J. C., Park, S., Renouf, M. A. and Webster, T. (2005). Organic sugar production in Australia: Grassroots reform to improved financial and environmental sustainability. In: Miroslav Rebernik and Matjaz Mulej and Tadej Kroslin, STIQUE 2004. Proceedings of the 7th International Conference on Linking Systems Thinking, Innovation, Quality, Entrepreneurship and Environment. 7th International Conference on Linking Systems Thinking, Maribor, Slovenia, (13-19). 23-26 June, 2004. Antony, G., Smith, D.M., Biggs, J., Renouf, M. A. and Webster, T. (2005). Sustainability and organic sugar production in Australia. In: Identifying Production - Environmental Tradeoffs at the Farm Level. AgSIP 13 Resource Economics Workshop, Rockhampton, (1-5). 28 October 2005. Prasad, P., Pagan, R. and Renouf, M. (2004). A critical Analysis of Cleaner Production in Queensland’s Food Industry – Past Efforts and Future Opportunities. In: Proceedings of the Asia Pacific Roundtable for Cleaner Production Conference. Asia Pacific Roundtable for Cleaner Production Conference, Kuala Lumpur, Malaysia, (). 15-18 March 2004. Renouf, M. A. (2002). Preliminary Life Cycle Assessment (LCA) of Electricity Generation from Bagasse. In: Proceedings of Australian Sugar Cane Technologists. ASSCT 24th Conference, Cairns 2002, Cairns, (). 29th April - 2nd May, 2002. Energy recovery from wet wastes: A viable cleaner production option? Renouf, M. A., Pullar, S. and Pagan, R. J. (1999). Energy recovery from wet wastes: A viable cleaner production option?. In: J. A. Scott and R. J. Pagan, Global Competitiveness Through Cleaner Production. 2nd Asia Pacific Cleaner Production Roundtable, Brisbane, Convention Centre, (543-556). 21st - 23rd April, 1999. Renouf, M. A., Pullar, S. and Pagan, R. J. (1999). Promoting managerial efficiency through cleaner production: A bakery case study. In: J. A. Scott and R. J. Pagan, Global Competitiveness Through Cleaner Production. 2nd Asia Pacific Cleaner Production Roundtable, Brisbane Convention Cen., (377-386). 21st - 23rd April, 1999. Marguerite Renouf (2011). Environmental evaluation of product diversification in sugarcane systems using life-cycle assessment: An Australian case study PhD Thesis, School of Geography, Planning & Env Management, The University of Queensland. Note for students: Dr Marguerite Renouf is not currently available to take on new students. The impact of Australia's carbon tax on a non-qualifying emissions intensive trade exposed manufacturing industry: demonstrating the utility of systems dynamics and life cycle assessment for policy analysis.